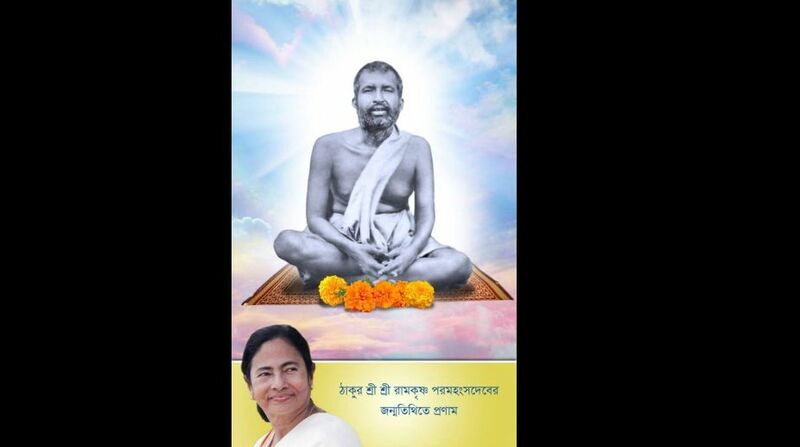 West Bengal Chief Minister Mamata Banerjee on Saturday remembered Sri Sri Ramakrishna Paramhansa Dev on his 182nd birth anniversary. Banerjee took to Twitter, to pay her respect to Sri Sri Ramakrishna Paramhansa Dev. Ramakrishna was born on 18 February 1836, in the village of Kamarpukur, in the Hooghly district of West Bengal, into a very poor and orthodox Brahmin family. Ramakrishna was given to spiritual ecstacies from a young age, and was influenced by several religious traditions, including devotion toward the goddess Kali, Tantra, Vaishnava bhakti, and Advaita Vedanta. His legacy was carried forward by his most prominent disciple Swami Vivekananda through Ramakrishna Mission. Ramakrishna’s religious and spiritual philosophy was centred around Shakto, Advaita Vedanta, universal tolerance. His teachings and conversations with his disciples were recorded by his devotee Mahendranath Gupta and the collective work was titled as Sri Sri Ramakrishna Kathamrita (The Nectar of Sri Ramakrishna’s Words).